A behind-the-scenes look into the tech company’s mission, how it all began and where it is now. Glenn Riseley, HeadUp founder and CEO, spent 14 years in the corporate wellness sector developing a world-class program for global businesses to improve the wellbeing of their employees. He has now shifted his focus and experience to the consumer. Bringing the HeadUp vision to fruition. Armed with the knowledge that innovative tech would be the key to a new era in healthcare, Glenn began thinking of a way to consolidate wearable device data, information from doctors, and personal health observations. Very soon, the idea of a ‘human dashboard’ was born. He enlisted a team of data scientists, user experience and product specialists, and coders, to bring it to life. First, they built algorithms to process the health data found on people’s wearable devices. The idea was that the algorithms would trawl through a person’s data to uncover interesting patterns and trends, as well as any problem areas – and feed this information back to a dashboard. That way, at one glance, anyone could see how their health was tracking, where it should be, and most importantly, how to improve it. The most natural thing to do was to package the human dashboard into an app so that people could easily access their personalised health information. But before this could happen, the algorithms needed to be tested. Testing stages – the Insiders Experiment. Anyone and everyone that owned a Fitbit was asked to join the Insiders Program. In exchange for access to their data, ‘Insiders’ would receive personalised insights about their health and fitness. Insiders were asked to check-in every day so that HeadUp’s data scientists could track their mood, too. The experiment was supposed to run for 2-3 weeks – long enough to stockpile data, understand what the algorithms could do, and flag any limitations. It ran for 8 months. Why? Because Insiders were engaged with the program. They liked it. They liked checking in. They liked the insights. So the experiment kept running, and in the process, produced a smorgasbord of valuable data. The most exciting take-home message was: the algorithms worked. While the Insiders Experiment was tracking along, the first version of the app was being built. The time had come to merge the two. 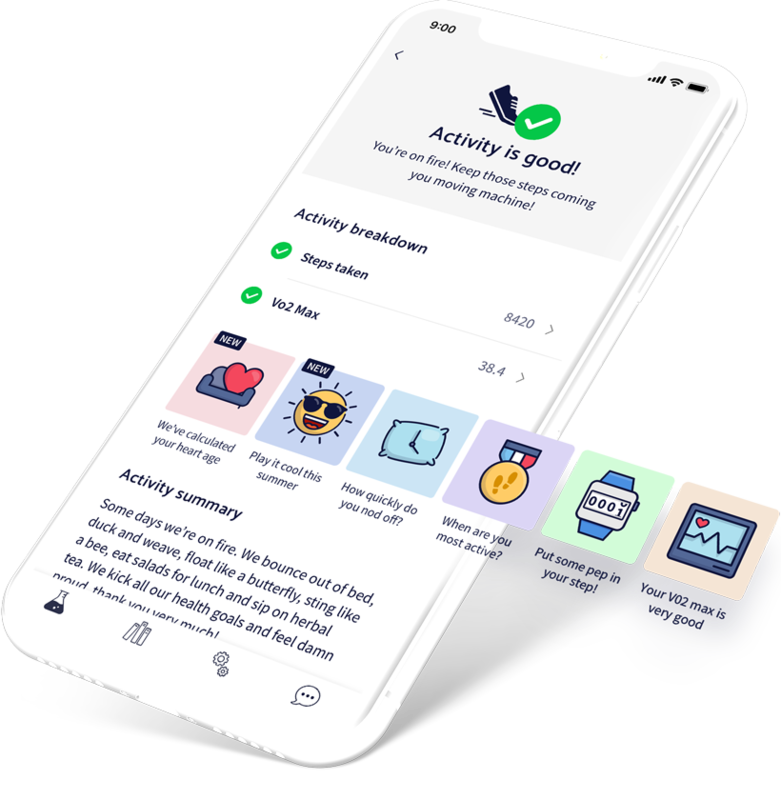 The HeadUp Labs app launched in Q4 of 2018. It’s free and easy to use: a new user simply has to sync their Fitbit or Apple Watch to get started. HeadUp data scientists analyse users’ mind, heart, sleep, weight and activity data to provide a rating for each. These ratings are then displayed on the user’s human dashboard. As more data is collected, personalised insights kick in. The app is continuously being loaded up with new insights, ratings and fascinating titbits – all personalised to each user. In the process it’s becoming more valuable, interesting, and entertaining to use. In short, the app is getting smarter – and what it can give to people is getting smarter, too. The future is exciting. Everything HeadUp does is informed by data and user experience – so it’s only natural that the app evolves a little more with each passing day. People change. Data changes. And HeadUp changes with it – which is fitting. The app provides users with an evidence-based way to improve their health – and everything the company does to help people is evidence-based, too. Though the wheels are always turning, and the team is always growing – the company mission has never wavered. It was and always will be to help people take control of their health. And not just live a longer life – but to live a better one.